At its narrowest point, the Mykale Strait separating the Greek island of Samos from mainland Turkey—and the rest of the Asian continent—is just 1,430 meters wide. 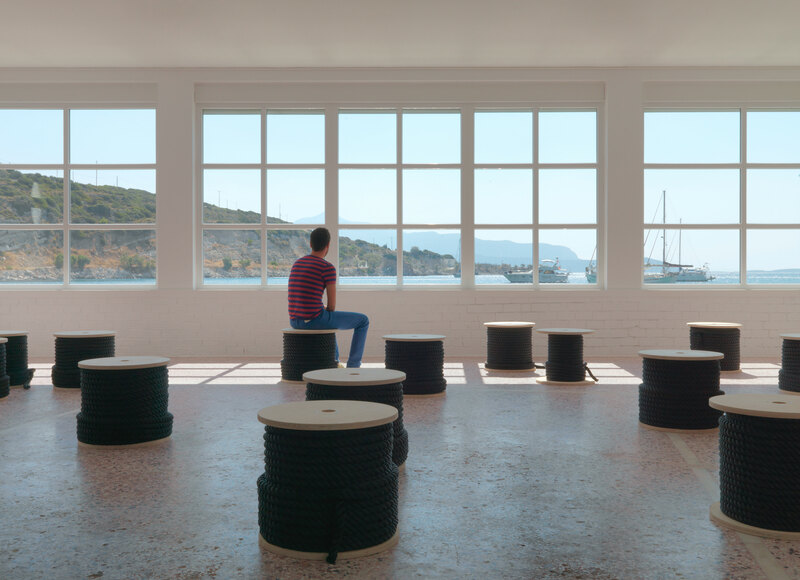 In the main gallery of Art Space Pythagorion, which has a direct view across the strait to the Anatolian coastline, Nevin Aladağ has placed 15 wooden spools wound with thick black rope—each 100 meters in length, except one that is 30 meters—to represent the distance of this watery crossing, in an installation called Beeline (2014). That the rope was cut into lengths suggested the dotted black lines often found on maps to mark maritime boundaries. Yet it also hinted at bleak current affairs, such as the thousands of migrants annually trying to cross the Aegean Sea from Turkey into the European Union, the severed lives their journeys represent, and perhaps even the tactics used by EU border guards (Frontex) that include slashing inflatable rafts to prevent desperate people from reaching safe harbor. Meanwhile, in the background of Beeline plays a sound piece, High Season (2014), a recording of beach-goers splashing in the water, children playing, and what is perhaps the sound of an arriving boat. But where is the craft traveling from, and who are its passengers?